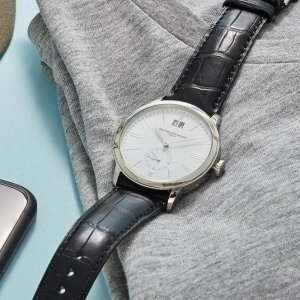 JomaShop.com offers the Baume and Mercier Classima GMT Time Zone Silver Dial Men's Watch MOA10218 for $599 via coupon code EXBM599 . Features: Stainless steel case with a black leather strap. Fixed stainless steel bezel. Silver dial with silver-tone hands and index hour markers. Roman numerals mark the 3 and 9 o'clock positions. Luminescent hands and markers. Date display at the 12 o'clock position. 2nd time zone sub-dial. Quartz movement. Scratch resistant sapphire crystal. Solid case back. Case size: 40 mm. Water resistant at 50 meters / 165 feet.